I was recently able to stop by The Free Store 15104 in Braddock and see the amazing way this is helping so many! 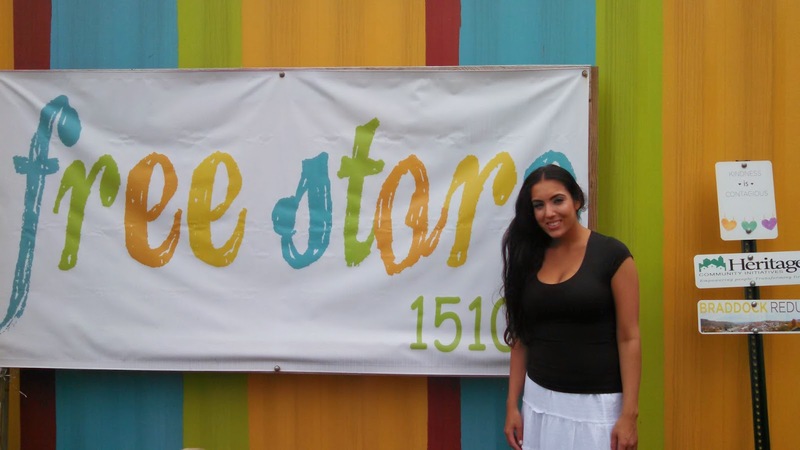 The Free Store was created by Gisele Fetterman, wife of Braddock Mayor John Fetterman. Together they are working in an amazing way to bring life & vitality to a part of our city that had lost 90% of its population, homes & businesses. They've been involved in bringing organic gardens to Braddock and have many creative projects and visions for moving their community forward. They are a couple that gets things done in the best way - with love, kindness, & generosity! 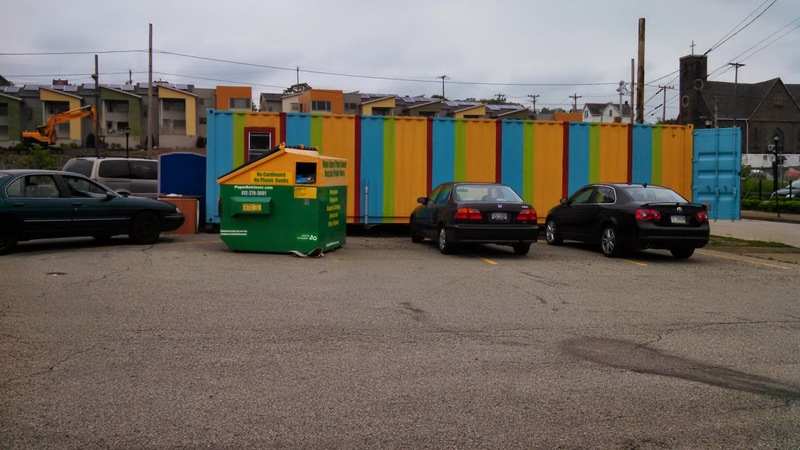 The Free Store operates out of a colorful shipping container on a donated piece of land. The shipping container is located at 420 Braddock Ave, Braddock PA 15104. The shop is currently open from 1-2:30 on Tuesdays/Thursdays and by appointment. They are also open many Saturday mornings, but the hours may vary based on volunteers available. They operate fully by a wonderful group of faithful volunteers who help with the day-to-day process. Go here to find out how to be a volunteer! Donations are happily accepted! They are most readily stocked with clothing, shoes, toys, books & some household items. But they are also take bigger donations if there is a need - just call before you would drop a large item off. They have several businesses that have donated surplus, including Costco & Osh Kosh B'Gosh. 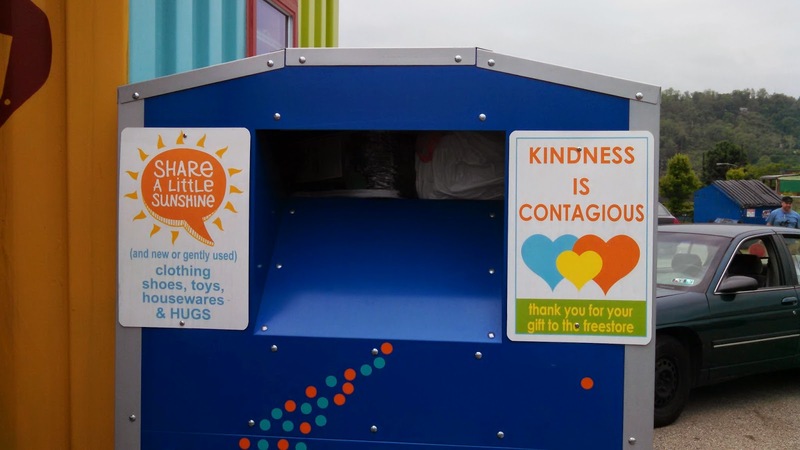 Even recently, they accepted hundreds of boxes of new clothes from Gymboree & Crazy 8! 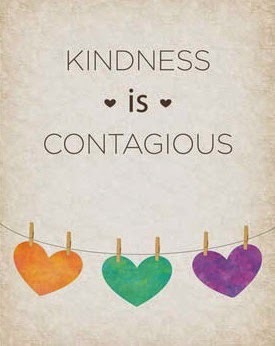 Anyone is welcome to "shop" there, they just ask that you take only what you need + pay it forward! The environment of the store is warm, friendly, & happy! 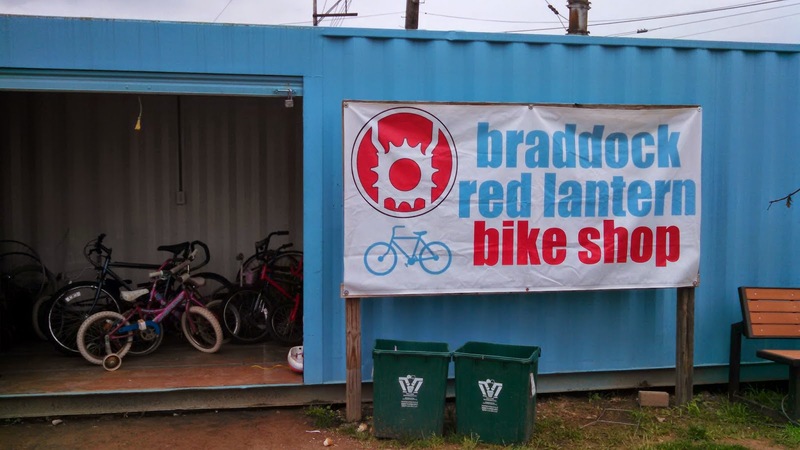 They also have a neighbor shipping container that is the Red Lantern Bike Shop. This venue is operated by Brian Sink and it receives donated broken and unused bikes. The bikes are then refurbished and redistributed back into the community. Please donate bikes to this awesome organization when you have ones that your family no longer needs! I was even able to get bike helmets for my 2 foster children which allows them to love & enjoy family bike rides! Red Lantern is typically open on Saturday mornings, but based on volunteer availability, you may sometimes find them open throughout the week. My friend, Nadine, from The Pittsburgh Mommy Blog, has organized the first EVER "Free Store 15104" Donation Drive! The Summer Music and Marketplace Series will be going on featuring great music (3-7pm), the I Made It! Market! (2-7pm), and the Farm to Table Pittsburgh Farmer's Market. They will gladly accept your gently used clothing (baby, maternity, and adult), accessories, linens, baby gear, toys, kitchen accessories and other small items. Go here to RSVP and see any other details. I have no doubt that the community of Pittsburgh is going to continue to support this endeavor of people giving back into the community. Be a part of that effort and donate to FREE STORE 15104! More success to The Free Store! Hi, Thank you for sharing this informative content. I'm interested on how this works? because I have a lot of used shoes to donate. I'm looking forward for your answers. Again, Thank you! Scientists at the University of Arizona looked at more than 6,000 patients with injuries, bicycle accidents. this is such a great job you guys do, The draft of the new General Regulation of Circulation raises the mandatory use of bicycle helmet, a controversial measure among many groups of bicycle users.